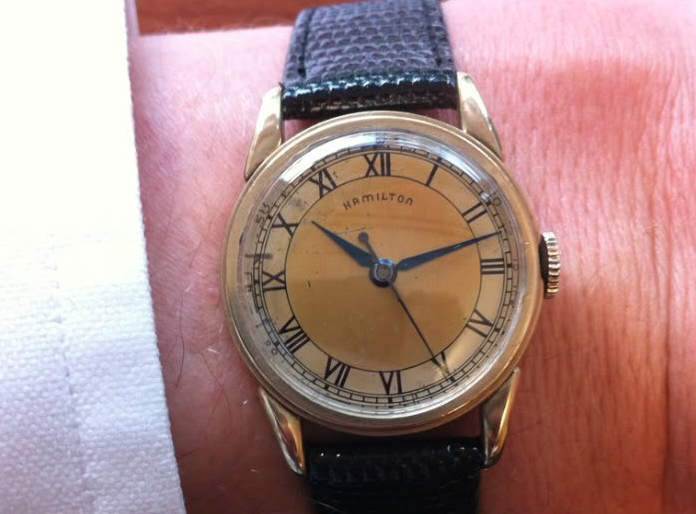 Vintage Hamilton Watch Restoration: 1940 Sentinel - "Gentlemen, synchronize your watches"
1940 Sentinel - "Gentlemen, synchronize your watches"
In the advent of WWII, Hamilton introduced it's first central sweep second wrist watch with a "hacking" feature. Inside the movement is a lever that will engage the balance and stop (hack) the watch when the crown is pulled out to set the time. 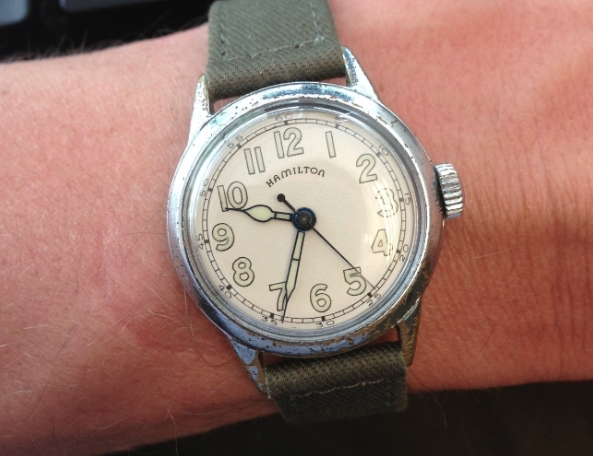 This feature would be included on several of the WWII-issued military watches Hamilton produced, mostly for the US Navy and Marine Corps. 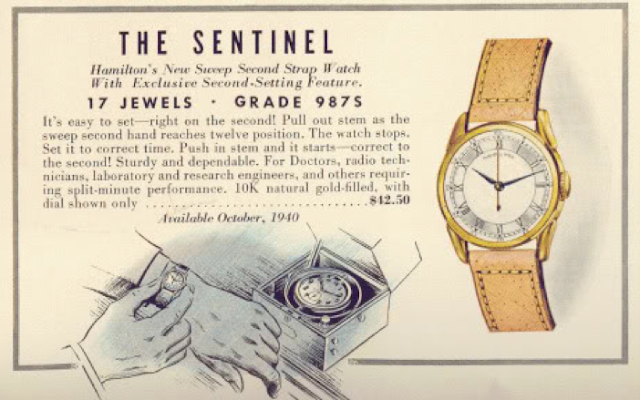 Only manufactured for two years, the Sentinel was introduced in 1940. The Sentinel featured an enamel dial with roman numerals. 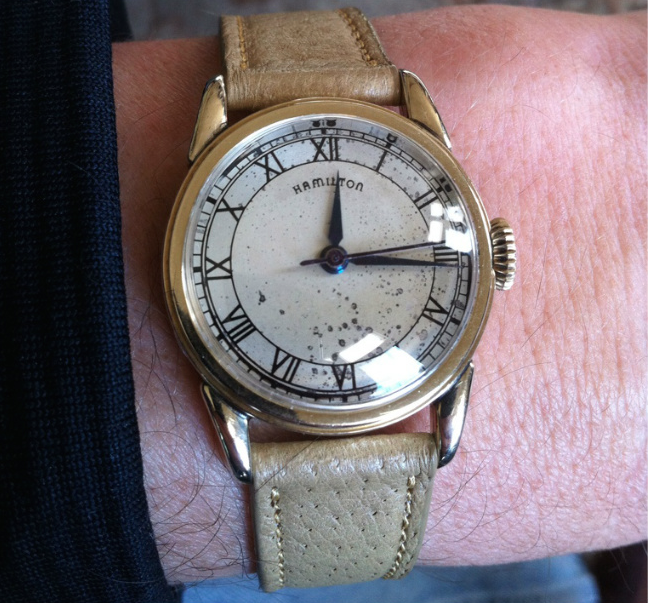 Some price lists show that an Applied Gold Numeral dial was later introduced and that the watch did not have a second hand. Everything but the roman numeral dial was reintroduced after the war as the Secometer - same case, same movement, same hands, etc. The Sentinel featured the 6/0 sized 17 jewel 987S movement. This movement is a sibling to the 987A introduced a couple of years prior. It includes the addition of an extra wheel to drive the second hand and the center wheel (that drives the minute hand) is a hollow tube to allow the second pinion shaft to pass through the movement. Wear through is typically found on the tops of the lugs but good examples can often be found. Case backs will often show wear to the lip used to open the watch and repairs are not uncommon. On the wrist the Sentinel is a classic looking watch from a bygone era. It's hard to not recall the old WWII scenes where watches were set to the exact time needed to synchronize an assault. During the war, Hamilton produced military watches with 987S movements as well as an 18 jewel version called the 2987 - where the second hand pinion end was held in an additional jewel. These watches came with both white and black dials with luminous hands and markers. i have one like the one in the first picture in perfect conditions. how rare it is? Not particularly rare but less common than the Secometer that came in the same case. What would be the value of a civilian Sentinel in very good running condition? The one I have is a presentation piece and the dedication is 1944.